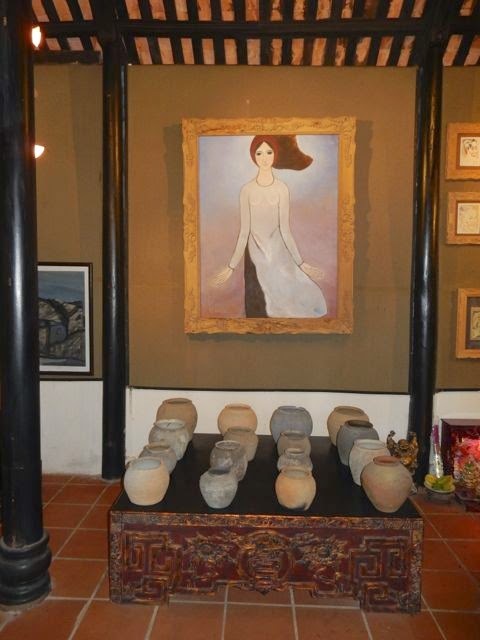 Audrey's Blog: What Better than Food and Art to Close Out Vietnam! What Better than Food and Art to Close Out Vietnam! There are two stars in Vietnam: creative food and artist gems. Wherever we were taken for a meal, it was in a dreamlike setting, jungly, peopled by orange and gold carp swimming in curvatious ponds, welcoming servers leading you to your chair, pointing you at it so you will sit, holding your chair, pushing your chair closer to the table, and unfolding a napkin (at least we have real napkins in Vietnam) and making you feel like a somebody you ought to know. The oversized menus were usually sub-lined with English. I’d quickly search for dumplings, spring rolls (fresh or fried), green mango or green papaya or pomelo salad, and now the new craving in my food world, the banana flower salad. Beware, however the little red dots - those are wildly hot peppers. 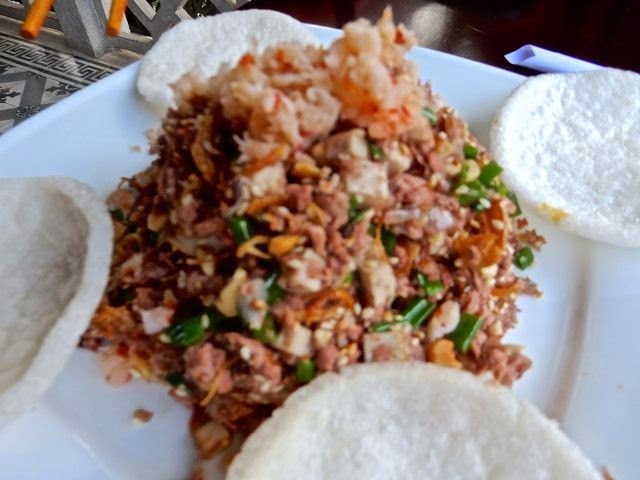 One restaurant we were taken to offered a salad with the works: (let me tell you, everything is julienne, or sliced in long thin strips, or chopped very very fine whether garlic or lettuce or green onions, and this is what make it palatable.) There was a salad with shrimp, squid, cilantro, parsley, carrots, lettuce, cucumber, zucchini, green onions, shallots fried in hot oil, peanuts chopped fine, sesame seeds, banana flower thinly sliced, green papaya thinly sliced and a dressing made from fish sauce (always), vinegar, palm sugar, soy sauce and a dab of salt and black pepper. This was a meal I could get accustomed to if I didn’t have to do all the slicing. 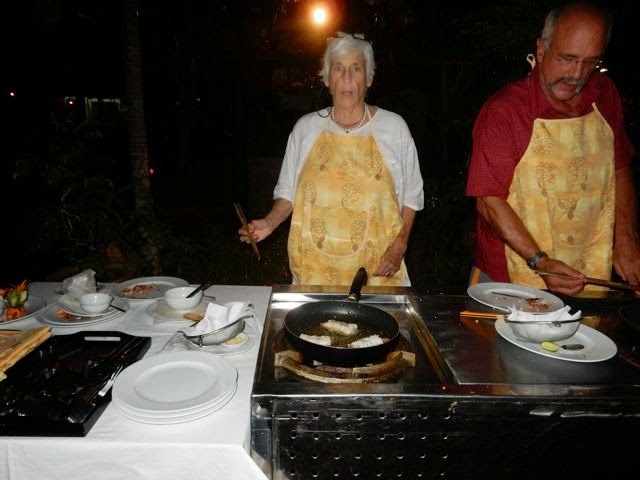 The second night in Hue, we attended a private cooking school at a super environmental restaurant (as above) and had the whole thing outside under a bright half moon and the light of the fire. 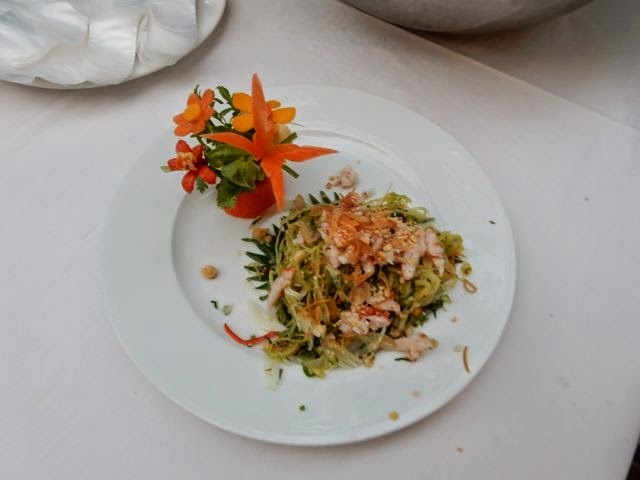 Not only did we learn to make the banana flower salad (a simpler version) but also how to make pork and shrimp wrapped in an edible netting (a different kind of wonton wrap) and fried in the wok. The pork had been hopped and I added green onions, garlic, grated ginger and other things and mushed it up by hands (in plastic gloves) and the shrimp was blue raw. But once it was all dumped into the hot peanut oil, sizzle and crack and I had something delicious to eat. We also were shown a red snapper recipe with sweet and sour sauce, and for dessert, taro mousse. How do you sleep on that full stomach? Another discovery at one of these garden-patio styled restaurants where even on a blistering hot day, you could sit outside in the shade and not suffer, was fig salad. Now this is not your traditional soft, seedy fig. 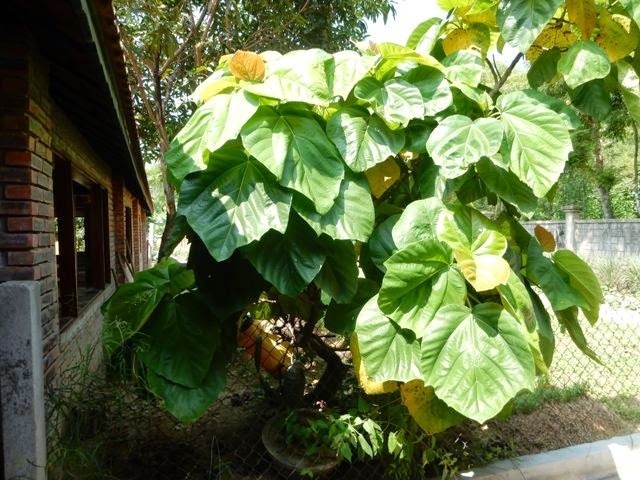 It’s Vietnamese fig which has a shape like a winter squash and a outside skin just as similar. It was not sweet, but it was soft almost as if you were eating ground pork. I wasn’t convinced it was a real fig, until the owner showed me the tree in the back of his compound. It had fig leaves 4 times the size of our fig leaves and yes, the figs hung on a short stem off the branches and trunk of the tree. It must be peculiar to this part of the world and that is a shame. It was delicious. 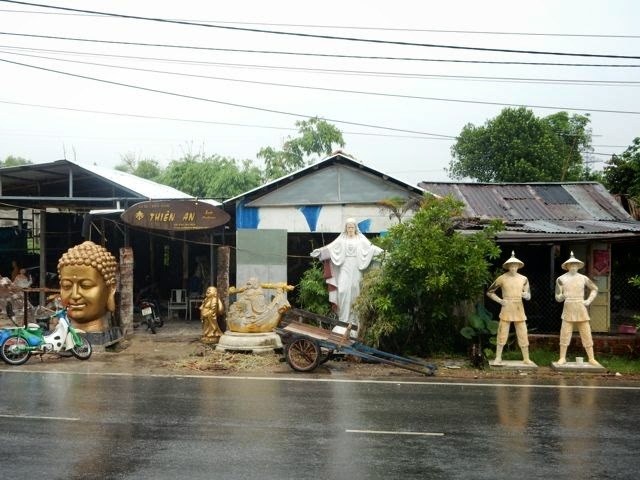 At the direction of friend and art advocate Suzanne Lecht, we were able to visit the home and studio of one of her very contemporary artist, Le Thua Tien, who goes way beyond art for art’s sake and tries to draw attention to the failings of our caretaking of this earth. He works in charcoal, as a protest for the devastation of forests not only here in Vietnam, but all over the world. His first piece was a charcoal ball almost as big in diameter as a tractor wheel. 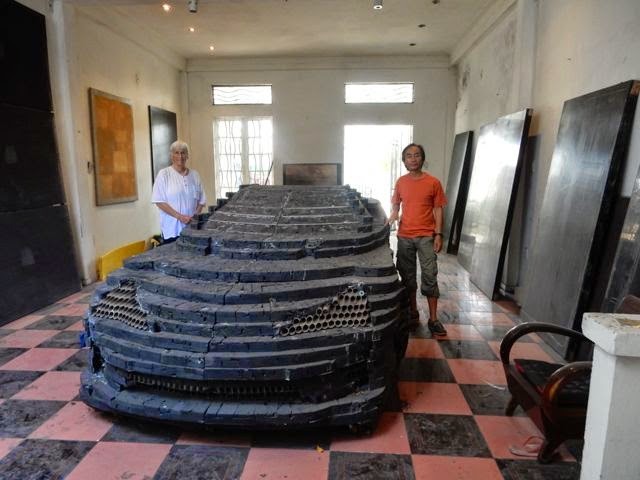 But now he is working on a real challenge - a charcoal Lexus. Really. With all the jazz that goes with a fancy Lexus. It is still in the works, but he welcomed us in his studio to get a peek at what is going on. He works frequently in charcoal, and is highly influenced by the works of Mark Rothko, particularly the Black Chapel in Houston Texas. He spent summers in Vermont developing as an artist as well. Le said the tradition in Vietnam is not the sophisticated caligraphy and ink drawings on scrolls, but sculpture - the millions of statues made of and for every form of Buddha that anyone has been able to come up with, all those hand-carved pieces that sit on people’s altars at home or that they bring to the temples. Other than this, there isn’t much to draw from in Vietnam history. He should know. 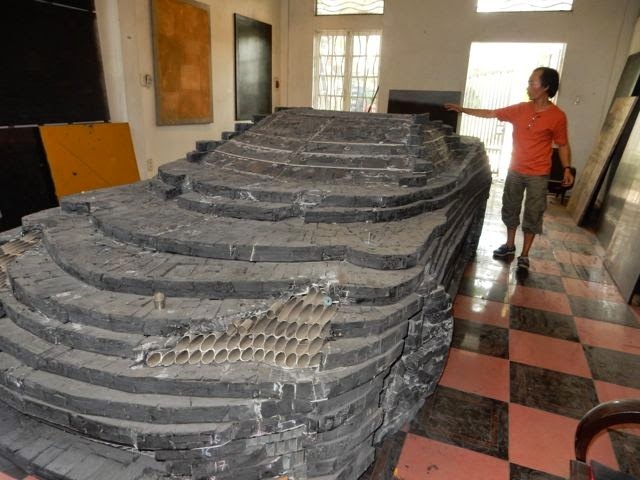 He has taught art at the Vietnam Fine Arts University at Hue for more than 30 years. He finally quit and is now concentrating on making his statements through his sculptures and paintings. He also has been brazen in expressing in his paintings the pain and horrors of the Vietnam War. He and his father watched from a distance, unable to get there, as the American bombs destroyed a hospital where his mother and sister were located, leaving his father to care for seven children. That, of course, changed his life. Not only was there anger to deal with, but all the things a son would not be able to share with a mother. His Unsent Letters series in lacquer is unreadable mixtures of Vietnamese and English, expressing, I am sure, his pain. They are letters written to himself, but as large canvases. 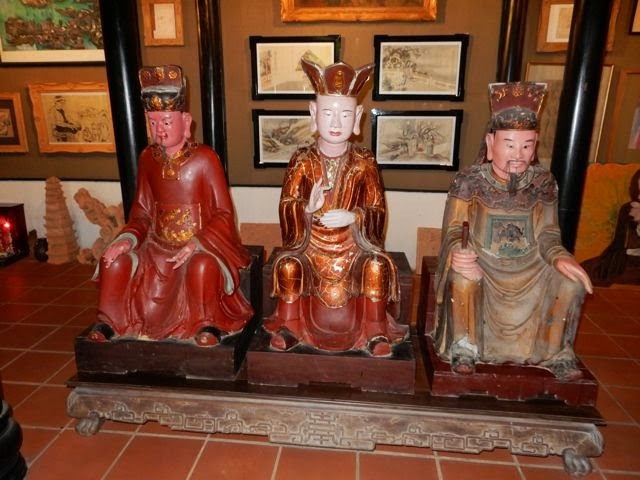 He also elevates the Vietnam use of lacquer (normally for crafts) in his work in a new way and at times incense. He also does performance art, installations and just about anything he needs to do to get his point across. I want to see him drive that charcoal Lexus when it is finished. But it will only move in sections. The wheels are turned inward (the hardest part, he said) and there will be reflections where windows should be. Really a cool work of art. For a more sublime kind of art, we visited the elegant estate of Bai Tran, only the second recognized female artist in Vietnam who has sold a number of her paintings through Sothebys and Christies auction houses. 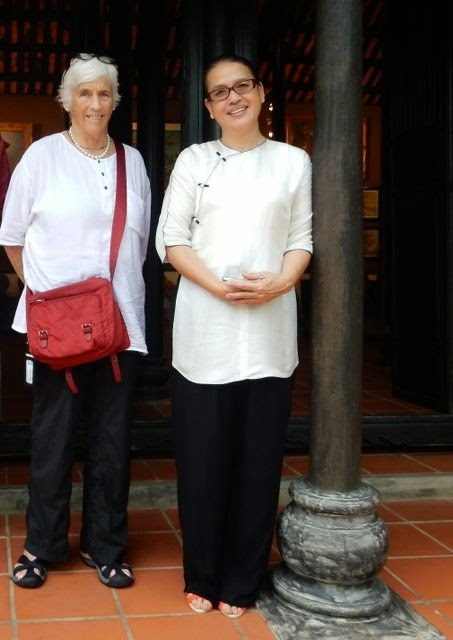 Bai Tran herself is a picture of dignity in her simple white silk top and black silk trousers. She speaks gently and falters now and then in her English, but her assistant is always in the background to translate or help her if needed. Her work moves like an impressionist wind, in pale colors, nothing harsh, mostly women that resemble her and probably her grown daughter. For sure, Bai Tran has put the mother in her into her paintings, since like any mother, the tragedy of losing her son a few years ago, never leaves her breath. Even when you are overwhelmed by the gentle simplicity of the women in their Vietnam “ao dai”, and the beauty of the flowers they hold, there is something lonely about the way the dark haired woman stares out of the frame with her black eyes not moving, even as she cradles her son in her lap just as our Holy Virgin Mary did her crucified son Jesus in traditional Lamentation paintings. She lives in a rambling garden with various structures of dark wood and plenty of ghost bars, (One must master stepping over the ghost bars so has not to trip when you didn’t gage the height well). A major open aired large room, off by itself, she created especially to hold the altar to her son, where photographs of his life cover the walls, and there is an special table under a favorite photograph with lit candles, flowers and other offerings and remembrances. She walks through its space smiling softly to keep back the tears we all feel. Her son’s life was given as he tried to rescue someone drowning in a huge wave on the beaches of southern California, where he and his sister lived. Bai Tran’s daughter still lives in San Diego, with husband and two children, and this is the retreat where Bai Tran goes to as often as possible. bought from the Roman Catholic Church next door. There is plenty of land on Thien An Hill, well treed and misty with plants and wild things still in her view, but she is expanding so she has more garden to stroll through with her short-haired dogs and to meditate and to inspire her to her art. She lives alone but with 50 assistants who tend the gardens and her activities. She has produced a number of books and her well worn catalogues from the two auction houses show that she is proud she has entered into the art world’s extensive collections. In our last comment we mentioned having Spirit Houses and Ghost Bars. However, we failed to say anything about a lucky dragon. If you locate one, please send it our way. We need all the good luck we can find! 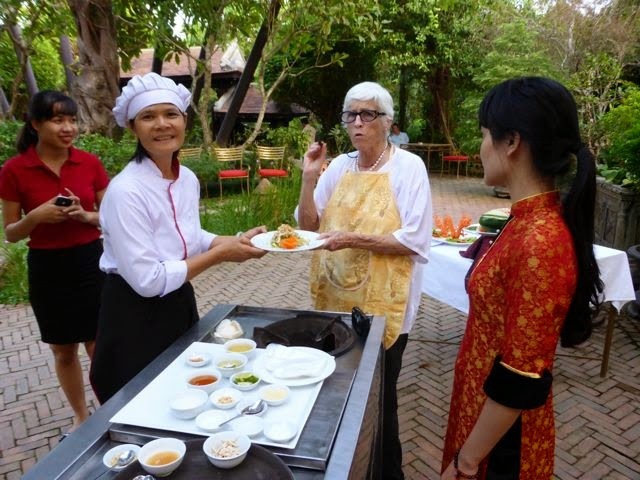 After going to the cooking school, you have probably learned how to prepare the exotic Vietnamese dishes that appear in your photo to be very delicious. Why don't you teach the chef at The Hunt & Polo Club how to cook Vietnamese food??? That would be really neat! By the way, is their an upscale Vietnamese restaurant in Memphis? If so, we' have to try it. 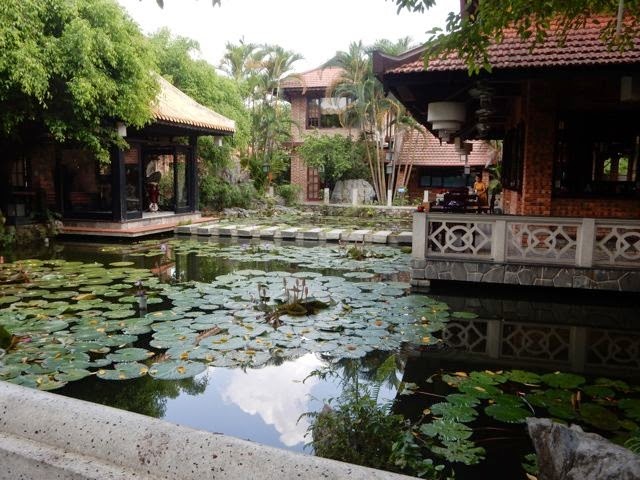 Bai Tran's estate is very beautiful. You can just tell by the photo of the two of you that she is a nice person. Obviously, this pretty lady is a very fine artist! You are moving at such a fast pace and cramming so much into every day! When you return home, how in the world are you going to slow down?